Did he enjoy it? "It was the best win of my life," he said. "Taking the Crimson Blazer here has been my dream." The 25-year-old Italian was the only one of the semi-finalists who hadn't worn the blazer as he moved into the company of the world's elite match racing sailors with his first win in a Grade 1 event. Even then, the conditions were so fragile - and this was after winds in the high-20s had prevented any pre-event practice only five days earlier - PRO Randy Smith cut the title and petite finals from best-of-threes to single matches. So, after Ferrarese had spotted Great Britain's Ian Williams - the double defending champ and world No. 1 - their first semifinal match before winning the next two and Baird had dispatched France's Mathieu Richard with wins in their first and third go-rounds, it all came down to a single race. That's when Smith also ordered the windward-leeward, twice-around course shortened from a 0.35 nautical mile to 0.25 - a mere quarter-mile that seemed to suffice. As it was, Ferrarese found breeze that nobody else could, first winning the favoured left side from Baird, who went right at the start, and extending his leads from 29 seconds at the first windward mark to 35 at the leeward, 48 at the second windward and finally 54 at the finish. Baird, asked earlier when he had driven his last match race, said, "My last monohull match race was July 3, 2007, at Valencia [Spain]." 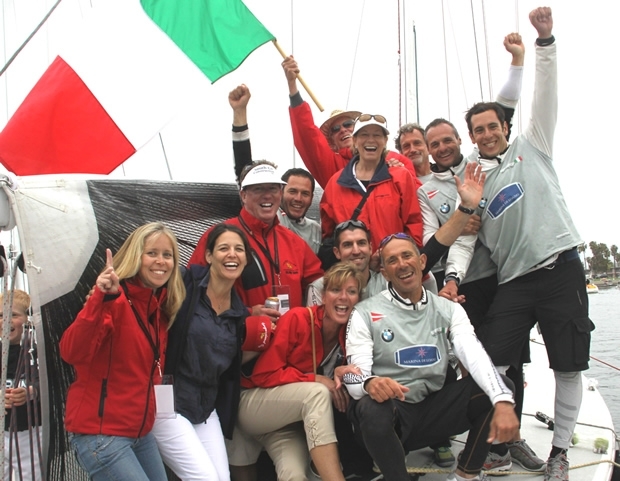 That was the day Baird steered the Swiss team Alinghi to victory in the America's Cup, leading to his selection as ISAF's World Yachtsman of the Year. Hutchinson, in fact, was invited to be a skipper in this event, but passed the privilege over to Baird, for whom he'll be calling tactics aboard the TP52 Quantum Racing series in Europe this year. As for Williams, who dominated the double round robin series with 16 wins in two races, he could only say: "Simone did a nice job today. He got the speed off the line best. But we enjoyed the week." Ed Baird, USA, def. Mathieu Richard, France, 2 seconds. Ferrarese d. Williams, 0:54 (Ferrarese wins, 1-0). 1. Scott Dickson, USA; 2. Taylor Canfield, U.S. Virgin Islands; 3. Adam Minoprio, New Zealand; 4. Laurie Jury, New Zealand; 5. Eric Monnin, Switzerland; 6. Jordan Reece, Australia. 1. Williams, 16-2; 2. Ferrarese, 13-5; 3. Baird, 12-6; 4. Richard, 11-7; 5. Minoprio, 10-8; 6. Canfield, 9-9; 7. Reece, 6-12; 8. Dickson and Jury, 5-13; 10. Monnin, 3-15.